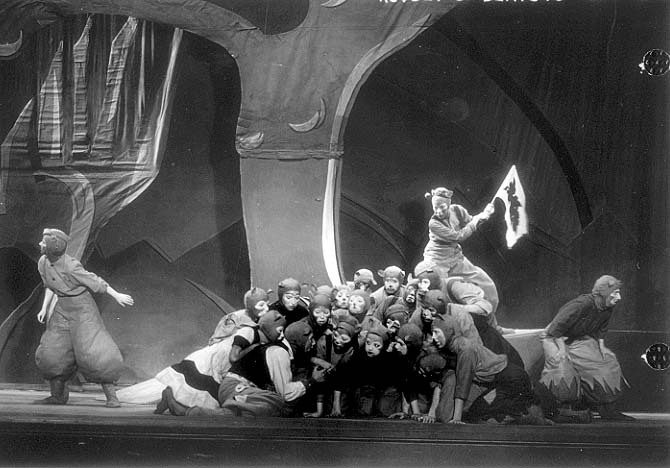 The Federal Theatre Project produced a variety of children's plays. The great majority were warmly received. 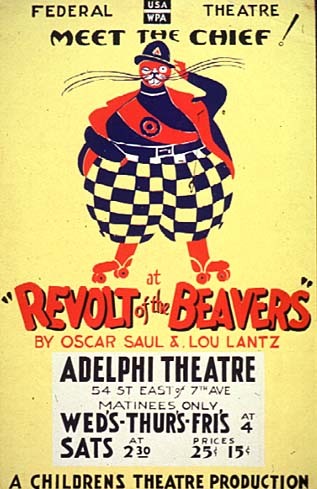 The Revolt of the Beavers, however, stirred political passions from the moment it premiered. In the play, two small children are transported to "Beaverland," where society is run by a cruel beaver chief. "The Chief" forces the other beavers to work endlessly on the "busy wheel," turning bark into food and clothing, then hoards everything for himself and his friends. With the help of the children, a beaver named Oakleaf organizes his brethren, overthrows The Chief, and establishes a society where everything is shared. The show played topacked houses during its brief New York City run, but its message drew fire. Theater critic Brooks Atkinson labeled it "Marxism à la Mother Goose." to discuss the overthrow of the Chief." A scene from The Revolt of the Beavers.